To the naked eye, powdery mildew can be detected by the small white powder spots that look similar to sprinkled flour. 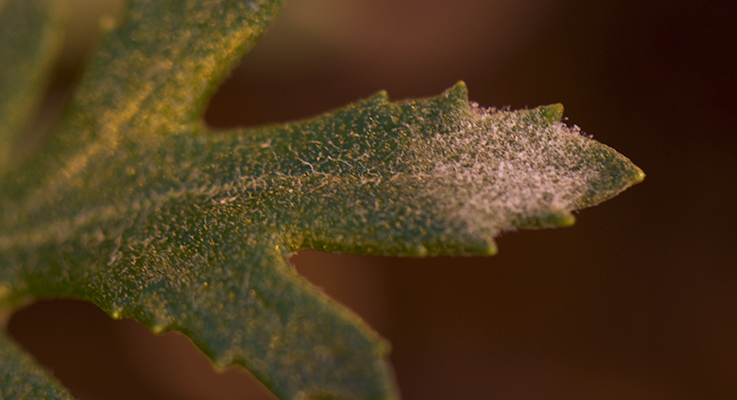 Powdery mildew can be a major problem for nursery managers and gardeners alike. Many commercial products are on the market but it is unclear which may be helpful and which may do harm to your garden or business at different application levels. Researchers at the University of Washington recently studied the use of organic fungicides for the control of powdery mildew on chrysanthemums. Several compounds commonly found in commercial products include ammonium oleate, malic acid, potassium laurate and sesame oil. Sound scientific evidence is needed to keep the public from using possibly harmful compounds that have little to no fungicidal qualities. Powdery mildew is a fungal disease that commonly affects 10,000 plant species, including vegetables, fruits and greenhouse-grown ornamental plants (Mueller et al., 2003). Millions of dollars are spent annually to control this fungus. In order to control the disease, it is imperative that nursery managers understand the environmental conditions in which the fungus thrives. The first signs and symptoms generally appear when the temperatures tend to cool in late summer or early fall. High humidity tends to contribute to infection; however, dry conditions can create a favorable environment for the spread of the disease as well (Cornell University, 2011). Pesticide applications should be your last line of defense. The first step a nursery manager should take is to see if resistant plant varieties are available. If they are not available, susceptible plants should be grown in sunny locations with good air circulation (Percival, 2015). Nitrogen has been shown to contribute to the growth of powdery mildew (Braun and Cook, 2012). Therefore, care should be taken to ensure that plants are not overly fertilized with high nitrogen chemical fertilizers. If the above steps are taken and plants still become infected with the fungus, fungicides should be used when the environmental conditions are most favorable to the development of powdery mildew (Mueller et al., 2003). In the United States, powdery mildew populations have begun to show resistance to many synthetic fungicides (McGrath, 2001). Therefore, a successful nursery manager should alternate between fungicides with different modes of action to avoid the buildup of resistance. There are multiple environmental and human health issues associated with some of the more commonly used fungicides. Therefore, it is important to find alternative, safe and environmentally friendly options. Organic pesticides are becoming more and more widespread. However, if used improperly, organic pesticides can have some of the same problems as synthetic pesticides, as well as challenges of their own. Organic pesticides may not provide adequate control of the pest. They can harm other organisms that aren’t being targeted. Also, they require more frequent applications than synthetic pesticides (Beckerman, 2008). Additionally, organic pesticides are often under-researched and their effectiveness may be in question. It is important that the workers who apply fungicides know if they are applying preventative or curative fungicides. Preventative fungicides create a physical or chemical barrier to prevent an infection from taking place. These fungicides must be applied before signs of the fungus. Curative fungicides keep fungi from spreading from the original infection site. They can be applied after the infection occurs (Calvert and Chalker-Scott, 2014). Depending on the fungicide, applications need to be repeated every 7, 10 or 14 days (Beckerman, 2008). The prevalence of powdery mildew in the Pacific Northwest makes this study particularly important. Northwest garden and nursery managers are bound to run into problems with this disease at one point or another. Powdery mildew can diminish the economic value of plants and businesses. The compounds evaluated in this study are found in commercial products that claim to control powdery mildew. Ammonium oleate and potassium laurate are used in over 20 commonly used commercial products. Malic acid and sesame oil are each used in two commercial products (Washington State University, 2015). Two experiments were conducted: one to see if the fungicide was preventative, and the other to see if it was curative. In the preventative experiment, plants were sprayed twice: once, seven days before they were exposed to powdery mildew and then again one day before they were exposed to it. In the curative experiment, plants were sprayed once a week for three weeks after signs of the disease were observed. Then, once a week, researchers graded how severe the disease was on each plant. In the preventative experiments, ammonium oleate did not prevent the growth of powdery mildew. Plants applied with 2 percent ammonium oleate solutions had the same amount of disease as the plants applied with distilled water (control group). In the curative experiments, plants applied with ammonium oleate, on average, had 50 percent less powdery mildew two weeks after applications than the plants in the control. Ammonium oleate provided the best control of powdery mildew when applied weekly, immediately after the first appearance of the disease. A major negative effect of applying ammonium oleate is that it can be toxic to plants. Plants treated with 2 percent ammonium oleate solutions lost 21 percent more leaves. According to the results of the study, malic acid has no ability to control powdery mildew. There was no significant difference between malic acid applications and the control. Solutions containing 20 percent potassium laurate were found to be toxic to chrysanthemums. The plants’ growth was stunted and there were burns on the leaves. If growing chrysanthemums, it is recommended not to use any products with potassium laurate as an active ingredient. If you are dealing with different species of plants, caution is advised. Sesame oil was the most successful of the compounds tested. Results were inconclusive in the preventative experiments. However, in the curative experiments, sesame oil was moderately-to-highly effective. Two weeks after application, plants applied with sesame oil had 62 percent less powdery mildew than plants in the control group. However, sesame oil was slightly toxic. The plants receiving a 5 percent sesame oil application lost 26 percent more leaves than plants in the control group. Sesame oil is not recommended for ornamental plants because it decreases the plants’ aesthetic qualities. Dead aphids and fungus gnats were noticed on all the plants that were sprayed with sesame oil. This indicates that sesame oil can possibly be used as an insecticide. Though there has been no research on the insecticidal properties of sesame oil, it is found in two commercially sold insecticidal products (Washington State University, 2015). Organic pesticides tend to have a broad-spectrum mode of action. Therefore, if there are beneficial insects in the greenhouse, sesame oil should not be used. Sesame oil is effective for the control of powdery mildew, but the negative effects associated with its use need to be taken into consideration before applications. Sesame oil had the most effective properties for curing powdery mildew. Ammonium oleate also showed good potential. All the compounds resulted in leaf loss, and should therefore be used with caution. The results of this study are limited to greenhouse-grown plants. Further studies need to be conducted to see if these compounds can control powdery mildew growing on plants outside of the greenhouse. Future studies can also determine the best frequency and concentration of applications to control powdery mildew without negatively affecting plant quality. This research was part of his Master of Science thesis. It was accomplished with the help of Sarah Reichard (University of Washington), Linda Chalker-Scott (Washington State University) and Marianne Elliott (Washington State University). Beckerman, J. (2008). “Using organic fungicides.” Purdue University Extension. Bélanger, R. R., and Labbé, C. (2002). “Control of powdery mildews without chemicals: Prophylactic and biological alternatives for horticultural crops.” The Powdery Mildews: A Comprehensive Treatise. American Phytopathological Society Press. Braun, U., and Cook, R. T. A. (2012). Taxonomic Manual of the Ersiphales (Powdery Mildews). CBS Biodiversity Series. Calvert, I., and Chalker-Scott, L. (2014). “Organic fungicides for the home gardener.” WSU Extension Publications. Retrieved from http://cru.cahe.wsu.edu/CEPublications/FS128E/FS128E.pdf. Environmental Protection Agency. (2013). “Minimum risk pesticides.” Retrieved from http://www.epa.gov/oppbppd1/biopesticides/regtools/25b_list.htm. McGrath, M. T. (2001). “Fungicide resistance in cucurbit powdery mildew: Experiences and challenges.” Plant Disease 85:236–245. Mueller, D. S., Hung Y. C., Oetting, R. D., Iersel, M. W., and Buck, J. W. (2003). “Evaluation of electrolyzed oxidizing water for management of powdery mildew on Gerbera daisy.” Plant Disease 87:965–969. Percival, G. C. (2015). “Powdery mildew.” University of California Agriculture and Natural Resources Statewide IPM Program. Washington State University. (2015). “Pesticide Information Center Online (PICOL) Databases.” WSU Extension: Washington State Pest Management Resource Service. Retrieved from http://cru66.cahe.wsu.edu/LabelTolerance.html.